OCC: I shall rename the title as we go along in the story. Currently, the title is "Wily's Final Stand Part 1: A Giant Beast?!". IC: Mega Man had teleported at the front yard of the base. This is it... Suddenly, another robot teleported in. "I don't like being underground. They have very mean people." "Dave!" Mega Man was relieved to have his old partner back for Wily, as the upcoming fights would prove to be threatening. Up onto a cliff, Mega Man would see that familiar skull that Wily pastes on the front of his fortress. "So, you've finally made it, Mega Twerp!" Mega Man recognized the voice. "Wily! Give up now and I won't have to turn your robots into scrap metal!!" Oh...getting a little too confident, aren't you? Nyahahaha! Well, I'd hate for you to get me behind bars...go, Sniper Joes!!" Suddenly, two Sniper Joes jumped in front of the duo. Eddie teleported in, gave Mega Man a weapon tank, and teleported away. Mega Man used the weapon tank, and shot the first Sniper Joe, dealing 40 damage. Dave shot the first one as well, dealing another 40 damage. One of the Sniper Joes jumped back and shot Dave, dealing 20 damage, while the other put up a shield, making him invincible the next turn. Fawf teleported in, and looked around, clearly reconizing that something was wrong. Then he saw the Sniper Joes. "These guys? They arn't as tough as the DD girls, are they?" Fawful quickly said to Mega Man before shooting a green energy ball at one of the Sniper Joes, dealing 25 damage. The DD girls were previous enimies that they had faced in the past. Fawful silently waited, for he knew that someone else was going to come here too. "I guess one of the Sniper Joes had a hard day...because he seems much weaker than normal." Mega Man commented, shooting the unguarded Sniper Joe, dealing 40 damage. "These guys are stable warriors of Wily's army, but nowhere near as challenging as any of the DD Girls." The Sniper Joes heard Mega Man's remark, and they switched who was guarding. The unguarded Sniper Joe shot Mega Man, dealing 20 damage. Dave shot the unguarded Sniper Joe, dealing a solid 40 damage. Fawful was about to attack the unguarded Sniper Joe when someone said something from above. "I'VE FIANALLY FOUND YOU!" The voice said, and Fawful looked up and saw a man jump down next to them. He got out a sword, and Fawful instintly remembered who he was. Fawful shot a green energy ball at the man, dealing 25 damage. "Ouch! You fool! You won't stop me!" The man said back before striking his sword at Dave, Mega Man, and Fawful, dealing 30 damage each. Fawful turned around and looked at Mega Man. "This man has been disturbing my thoughts for quite a while. After I typed that one number into a certain keypad, I hurt him, and he vowed to find and kill me. It may sound weird, but It's true." Fawful said, quickly explaining who the man was. He had no idea how strong the man was, but he was worried. Fawful looked at the man. He was uneasy about him. Suddenly, the man laughed. "Do you want to see true power? Do you? Well, say goodbye to the Sniper Joe!" The man said, and suddenly, the Sniper Joe burst into flames and died instintly, while the man dealt 30 damage to Fawful and Mega Man. The man grinned. "See? You shall be doomed!" The man said, before laughing crazily. Fawful looked at Mega Man. "Did you see what he just did? This isn't good, is it?" Fawful asked, then shot a green energy ball at the man. He wasn't sure they would survive this battle. Mega Man simply smiled. "There's no way you'd be able to pull another attack off like that soon." Mega Man used a big fireball Atomic Fire, dealing 45 damage and burning the man for two turns (deals 4 damage per turn and halves attack). "Hey, random guy! You beat the blue bomber and you can expect a big pay!" That statement could go terribly, depending on if this guy is greedy... Dave continued the DD Combo, dealing 50 damage this time. Mega Man recognized the set of moves Dave was pulling off. Ah...that's from the DD Girls! Mega Man smirked, knowing that if Dave has copied a moveset from the DD Girls, they'd have a much bigger chance than before. Fawful laughed. "Your not the biggest threat we have!" Fawful said. Suddenly, the man's voice changed. "Why would you attack me? As if I did something to you? I don't even know where I am, or who you are. Why a-" The man started to say before he quickly pulled out his swords and did 30 damage to Mega Man, Dave, and Fawful. "As if we believed that act!" Fawful said, laughing. He turned into Dark Fawful and used a black tornado to deal 45 damage to the man. He was sure they would win. "Seeing as he's just a human..." Mega Man shot the man, dealing 40 damage. Dave kicked the man to knock him out, rather than killing him. "No matter how cruel a human is, they don't deserve death." "Wahahaha! It seems you have chosen to spare his life. That's just fine with me, as my army'll take all of you out in one clean sweep!" Suddenly, a Hot Dog appeared (a giant purple wolf), and breathed fire at the knocked out man, hoping to kill him. No human deserves death... Mega Man ran and took the fireball damage, dealing 40 damage. "You protected the fool who attacked you? Very well, your fate has been sealed! Wahahaha!" Eddie flew in and gave an energy tank to Mega Man, hoping he'd heal himself. Mega Man stared at the E-Tank, gave Eddie a thumbs up, and revived the man fully. OCC: I put the man in the middle of both the enemy team and our team, as it is undetermined whether or not he's on our side. Fawful looked at the man, hoping the man would join thier side. Fawful smiled. One of his strengths was that he could be very persuasive. He looked at the man. "Why would you join them? We spared your life, while they would rather have you dead. You could join them and try to kill us, or you could join us, the correct side. What is your pick?" Fawful said, and the man's expression changed. "Though that would not have killed me, I thank the fact that you saved me. I am almost invinicable, for I am not human." The man said. Fawful shot a green energy ball at the Hot Dog for 25 damage. He turned back to face the man. "Before you continue, I would like to know who exactly you are." Fawful said. The man laughed. "I was once called as strong as the deadliest creatures in the world. That is not true. However, I am known as Vialiwis." The man said, and he turned away, clearly not wanting to talk any more. "Glad you saw the light." Mega Man smiled, and shot the Hot Dog, dealing 40 damage. The Hot Dog roared, and shot a constant stream of fire, hitting everyone for 20 damage. Dave continued the DD Combo from earlier, dealing 70 damage to the Hot Dog. Mega Man saw Fawful beat down, certainly not going to survive another hit. However, Mega Man knew of Fawful's special ability, so didn't worry about the situation yet. Fawful smiled. He knew that this battle would end in thier favor. Fawful got out his vaccum and sucked up the Hot Dog and threw it out on the ground, dealing 40 damage. Fawful looked at Vialiwis, and he knew what Vialiwis was going to do. Vialiwis got out his two swords, as Fawful guessed, but he suddenly crouched down. Fawful was about to question him, but then Vialiwis ran extremly fast at the Hot Dog, and threw a sword. It hit him right in the chest, which destroyed the Hot Dog. Vialiwis grinned. "It seems I still have the skill. Now, what's next?" Vialiwis said, and Fawful answered the question in his head. I have no idea... Fawful thought, and waited for Mega Man to answer Vialiwis. "We scale the tower..." So the group climbed the tower without any interferences. "This...almost seems a little strange..." Suddenly, walls rose around them, and some of the ground collapsed, leaving them on a pillar. "You seem to have fallen into my trap, fools! Taste the power of the Mecha Dragon!!" The group heard a loud roar, and the Mecha Dragon crashed through the wall! Mega Man quickly switched to the Quick Boomerang, dealing an added 60 damage for the weapon being his weakness. "GRRRRRRRRRAWWW!!" The Mecha Dragon shot a stream of fireballs, striking Mega Man for 100 damage. Dave continued the DD Combo, dealing 90 damage to the Mecha Dragon. OCC: Vialiwis' fire cannot OHKO the Mecha Dragon, due to it being a boss. OCC: The fire does 130 damage. Fawful wasn't sure about this. The Mecha Dragon looked more powerful then any enimie they had ever faced. Just this time, they had Vialwis, who would surely use his fire. That could help. He looked at Vialwis. "I'm pretty sure I know what you are about to do, and this would be a good time to do it." Fawful said to him, and Vialwis turned to face Fawful. "I'm never that predicatible, but your assumption is correct." Vialwis said, and he shot fire at the Mecha Dragon, dealing 130 damage. Fawful then shot a green energy ball at it, dealing 25 damage. Best to save sp for later... Fawful thought, and he started to think of what attack to use next. "You can resist all you want, but you pests shall fall to the Mecha Dragon!!" Mega Man shot a Crash Bomb onto the Mecha Dragon. Dave went to the final part of his DD Combo, dealing 120 to the Mecha Dragon, but dealing 20 damage to himself. The Mecha Dragon roared, and rammed Dave off the pillar, instantly knocking him into the abyss below. "No, Dave!!" Mega Man heard a loud thump from below, meaning that there is ground. Dave is certainly destroyed for the most part though. As much as I hate to admit it...Wily may be right... Mega Man had a troubled look on his face. "What's wrong, Mega Pest? Have you finally realized that you've met your match?" Wily laughed, and his face disappeared from the screen. Dave stood up after the powerful blow from the Mecha Dragon, and looked around. It appeared to be a dark prison cell. Suddenly, Wily's face appeared on one of the screens. "Wahahaha! It appears you have fallen prey to the Mecha Dragon. Don't worry. Once all your friends are down here with you, I shall explain what I am going to do with each and every one of you." Wily grinned, and the screen turned off. "When did Wily get the ability to teleport? IS HE A ROBOT?" Fawful scowled, as he was clearly not amused. Losing Dave this early was not good, for that means the Mecha Dragon could easily take out all of them. Fawful then attacked the Mecha Dragon for 25 damage, before a thought occured to him. "Since when did I become the good guy? Well, it doesn't quite matter, considering there isn't much hope right now. Be prepared to fall in the pit." Fawful said before stopping himself from rambling. "I was going to say the same thing." Vialwis said, as he too looked un-easy as he attacked the Mecha Dragon for 30 damage. Fawful waited, and a sudden plan occured to him. I'll save it for later... Fawful thought. "You've clearly improved, big guy!" Mega Man smirked with amusement. Mega Man shot more Quick Boomerangs at the Mecha Dragon, dealing a boosted 60 damage. The Mecha Dragon was not pleased, and cast up a strong gust of wind, knocking both Fawful and Vialwis into the pit below. No... Mega Man shot more Quick Boomerangs at the Mecha Dragon, going for 60 more damage. Good...with a design as complex as the Mecha Dragon's, he won't be able to repair himself too easily... The Mecha Dragon simply bit Mega Man, and whipped him down the pit. This fight was over. "Uuuugh...where did everyone go...?" The lights in the prison cell suddenly lit up! Mega Man was relieved to know that his allies were with him, willing to help him in any situation. "Now that all you fools are down here, let me explain what I shall do to you weaklings. I have set up a dark labyrinth right outside of this prison cell. If you manage to get out, I'll let you have a second shot at my powerful creation in a basic room, not on a pillar. If you cannot get out...that's your problem! Now, here's the only rule. You can only go in pairs. If you decide otherwise, I can just open up the floor into spikes below. Good luck, twerps! Wahahaha!" "Wily...alright, Dave and I shall go west! You guys can't follow us due to that scumbag's rules..." Mega Man and Dave have ran into four Bladers! Mega Man used Quick Boomerang and destroyed them all. "I hope Fawful and Vialwis will be okay..."
OCC: In case you're wondering, there is something special about each square. Red squares trigger battles. Except for at the beginning where you'll be forced to fight, it's recommended you do not fight at low HP. 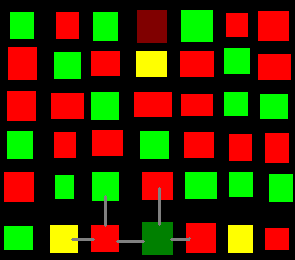 Green squares trigger an event. This can literally result in anything, including stat changes, harmful status effects, battles, teleportation, the list goes on! You'll be forced to step onto these spaces, and you have no idea what to expect! Yellow squares are rare, but they fully heal you. This should be the first thing you go to. The dark green square is where we've started, and the dark red square is where the Mecha Dragon is located. Fawful and Vialwis headed east, and came across what looked like a 2 La Jabas. "Shouldn't be too tough." Fawful thought, and Fawful shot a green energy ball at the first La-Jaba, destroying it, while Vialwis cut the 2nd one for 30 damage, destroying it. "Easier then I thought..." Vialwis said, and Fawful nodded. "Wonder how Mega Man is doing..." Fawful thought, and he assured himself that they were fine. OCC: I've been playing Mega Man a bit more recently . However, I have never played Mega Man V.
OCC: Nice. And about the enemies? It's Wily's labyrinth, so I'd like to be able to choose what we fight. IC: Mega Man and Dave saw a bright light, and went towards it. Though it was not the exit to this labyrinth, the team felt relaxed, at peace in this room. OCC: Sure. Also, does the yellow room heal Vialwis's fire? I'm going to give it back for now. IC: Fawful and Vialwis walked into the next room, and there was a sudden light, and they felt calm, for some reason. "Perhaps it's healing our energy?" Fawful said, and he didn't bother to listen to Vialwis said after that. "Pah, this game is more boring than I thought." Wily pressed a button, teleporting everyone to the Mecha Dragon's location. "Watching you rats stumble around in the maze was starting to bore me, so I'll let you be the Mecha Dragon's snack!" "Guys, it doesn't appear that the Mecha Dragon was able to recover too much. I'd say we have a chance now." Mega Man smirked. Mega Man examined the Mecha Dragon once more before charging his Mega Buster. The Mecha Dragon roared and blew flames onto Dave, dealing 60 damage. Dave used his Beam Power from his eye, dealing 100 damage. OCC: You don't need to start from the beginning, and you haven't joined in late at all. We're not even a sixth done with this topic. An energy bolt flew past the group and hit mecha dragon for 25 damage. "Sorry, did I miss much?" Protoman asked, walking in with his blaster raised. "No, not really." Mega Man said, as he turned to the Mecha Dragon. "Hey you! Yeah, you! No matter what you may say or do, the DD Girls will have always been our toughest fight. After that day, we can endure anything, you can count on it!" Mega Man sent off a semi-charged buster, dealing 50 damage to the Mecha Dragon. Dave started up a DD Combo, dealing a measly 30 damage. Heh...looks like Wily will start to see what the DD Girls had... The Mecha Dragon seemed insulted by Mega Man's comment and picked him up. He then threw him up into the ceiling, dealing 120 damage. "H-Heh...is that all you got, big guy...?" Mega Man smirked and knew that this fight would be won in the end.